*not the IKEA sort. Which is entirely unlike a bubble sort. I've wanted to write something about symbol relocations in ELF binaries for a while now, but it's become apparent that it's no small topic, since it depends on understanding of the Executable and Linkable Format. I'm going to try to report what I've found in as much detail as I can imagine before I realise what a monumental task it actually is. Relocation is the process of connecting symbolic references with symbolic definitions. While there are a few different types, the ones I'm interested in here are the runtime variety which enable the compilation of position independent code. In order to use absolute addressing, all the code – the application and all its DSOs – would have to be loaded into virtual memory locations known at compile time. Now while the linker can specify the virtual memory load-address for the executable, it cannot hope to do so for all the DSOs, since many of them will undoubtedly have been compiled separately (e.g. glibc). Even if that were possible, there's still ASLR to consider – and in some cases even the executable is compiled as position-independent to enable certain security features. There's therefore no practical alternative to indirect or PC-relative addressing, and in this post I'm going to focus on how to code for them. where self is an OS-supplied synonym for the process' own PID. I did something a little different, which I'll get to later on, if it's helpful, so the process image below is not for cat, but for my own application which relies on a simple DSO, libself.so. libself.so can read out the contents of its own /proc/self/maps file, and that data forms the basis for the graphic. So, what are we looking at here? The first two columns give the virtual memory start and end addresses for that section of the application image. The third column describes the permissions for the section, and it should be obvious which ones are read-only, read/write or have the execute flag set (it's worth noting for now that there are two types of read/write data sections: initialised and uninitialised). The p flag denotes "private", copy-on-write data. The "offset" column describes the offset into the binary image at which the section starts. I've omitted the "device" column from the print-out, which would otherwise have appeared between the "offset" and "inode" columns. The "offset" value can be mapped onto the ELF binary by consulting the program and section headers using readelf[2:example]. In a gross generalisation, I think there are two basic types indirect addressing: by PC-relative offset (i.e. by an offset from the current address of the instruction pointer), or through a pointer. There are two ELF constructs which assist in locating the runtime addresses of symbols (by which I mean function addresses as well): the Global Offset Table (GOT) and the Procedure Linkage Table (PLT). I'm sure you've already heard of them. The two sections contain address data for locating symbols at runtime, and act as a look-up table for and a source of indirection between code attempting to reference a symbol and the runtime location of that data. The values stored in the DSO's .got section are adjusted as part of the dynamic loader's initialisation process. Only some of the values in the .got.plt section are initialised at start-time, with the rest being initialised on-demand. There are some other facets of the initialisation process which I don't want to get into at the moment, including how symbol definitions can be overridden by values in other libraries or how "common" symbols can be copied to the data section of the executable. While almost all position-independent 32-bit code will reference _GLOBAL_OFFSET_TABLE_ at some point, 64-bit code can use ther relocation types to address values in the GOT, so you typically won't see the symbol being used in code as frequently. The address of the _GLOBAL_OFFSET_TABLE_ symbol may be located anywhere within the GOT, and that offsets from it may therefore be negative. I wonder whether all incarnations of gcc compile _GLOBAL_OFFSET_TABLE_ to be the same as the start-address of .got.plt. The first three quad-words of the .got.plt section are special and reserved, and act as part of the "trampoline" function in lazy function-linking, which leaves me in no doubt as the reason why they're designated as read-only. The operation of the PLT is one of the better-documented areas of an ELF binary, so I won't repeat it all here. Suffice it to say that on a lazy-linked function's initial invocation, the instruction pointer jumps using an address in .got.plt to the dynamic linker — which changes the contents at that .got.plt address to be the real address of the function — and then jumps again to that target function (all the jumping is important as the target function's eventual ret statement will still find the original return address on the stack). Subsequent invocations no longer detour via the dynamic linker but jump from the PLT directly to the target function. I've gone into a bit more detail about this in the supposed footnotes (although some of them look more like mini-epics). Anyway, let's have a look at what's on offer. The following types are listed in the AMD64 PDF, and I've taken the list which appears on page 35 in section 3.5.2 and added some detail. name@GOT: specifies the offset to the GOT entry for the symbol name from the base of the GOT. As in elf32, referring to an external or global symbol using wrt ..got causes the linker to build an entry in the GOT containing the address of the symbol, and the reference gives the distance from the beginning of the GOT to the entry; so you can add on the address of the GOT, load from the resulting address, and end up with the address of the symbol. A "represents the addend used to compute the value of the relocatable field." Another thing is that while it demonstrates how the modifier operates and what you get for your money, given the other options available in AMD64 assembly, it's unlikely you'll need to reach for this unless you really need to know the offset. As you've probably noticed, I'm quite keen on diagrams as an aid to understanding how things hang together, so I've had a go at representing the offset represented by the name@GOT modifier. I'm not convinced it's much use, since the dimensions are necessarily so small, but here's a go using the previous hexdump-style graphic. Please note that the following diagrams represent different examples, and not necessarily the ones we've discussed so far. name@GOTPLT: specifies the offset to the GOT entry for the symbol name from the base of the GOT, implying that there is a corresponding PLT entry. The @gotplt modifier can be used for .long and .quad. A procedure linkage table entry is generated for the symbol and a jump slot for the symbol is added to the GOT. The symbol term is replaced with the offset from the start of the GOT to the jump slot for the symbol. Given that these relocations target ELF binaries and not an instruction set, it doesn't seem unreasonable to think that the same may be true for x86_64. It seems that in x86-64 assembler the relocation requires a .quad field, since it's an 8-byte relocation. This modifier doesn't appear to be capable of being used in an instruction, although I haven't exhausted the search space and don't profess to have tried everything. The docs for the s390 say that a PLT entry is created for the symbol - this is true for x86 as well: if you want a PLT entry created for some symbol you can use this modifier to achieve that; however, there are more reasonable ways to achieve that. The value at address LhelloOff is read into %rax. The value in this case is negative 0x18 and already present in the DSO (i.e. written by the static linker). The value -0x18 is added to the address of _GLOBAL_OFFSET_TABLE_. This yields an offset in this case of 0x200fe8 - 0x18 = 0x200fd0. At offset 0x200fd0 of the runtime image is the value 0x7f7cf1843650, which given a virtual-memory load-address of 0x7f7cf1843000 gives an offset of 0x650 into the executable segment. The function sayHello begins at offset 0x650 of the executable segment. It's fairly clear that using sayHello@GOTPLT has created an two entries in the GOT: the value containing the offset (-0x18) and also the virtual address of sayHello. The address of sayHello would not otherwise be written to the GOT, only to the trampoline entry in the .got.plt section. name@GOTOFF: specifies the offset to the location of the symbol name from the base of the GOT. The @GOTOFF modifier generates an 8-byte relocation of type R_X86_64_GOTOFF64. name@GOTPCREL: specifies the offset to the GOT entry for the symbol name from the current code location. While RIP-relative addressing allows you to encode an instruction pointer relative data reference to foo with [rel foo], it's sometimes necessary to encode a RIP-relative reference to a linker-generated symbol pointer for symbol foo; this is done using wrt ..gotpcrel, e.g. [rel foo wrt ..gotpcrel]. Unlike in elf32, this relocation, combined with RIP-relative addressing, makes it possible to load an address from the [Global Offset Table] using a single instruction. Note that since RIP-relative references are limited to a signed 32-bit displacement, the GOT size accessible through this method is limited to 2 GB. The executable section was loaded into memory at address 0x7fb717760000. At offset 0x6d4 into the executable segment the mov instruction appears. It is seven bytes long and encodes a PC-relative relocation of +0x2008e5 from the address of the following instruction. The sum of 0x7fb7177606db (0x7fb717760000 + 0x6d4 + 7) and 0x200e85 is 0x7fb717960fc0. This appears in the read-only segment whose VM load-address was on this occasion 0x7fb717960000. name@PLT: specifies the offset to the PLT entry of symbol name from the current code location. Call near, relative, displacement relative to next instruction. 32-bit displacement sign extended to 64-bits in 64-bit mode. The above code snippets result in a relocation of type R_X86_64_PLT32. name@PLTOFF: specifies the offset to the PLT entry of symbol name from the base of the GOT. This relocation results in an entry of type R_X86_64_PLTOFF64. To continue this blogopus' theme of illustrating the memory-layouts and what each relocation actually represents, here's one showing the relocation $sayHello@PLTOFF. The library was loaded on this occasion at address 0x7f436d118000 and symbol _GLOBAL_OFFSET_TABLE_ is at offset 0x200fe8 therefrom. 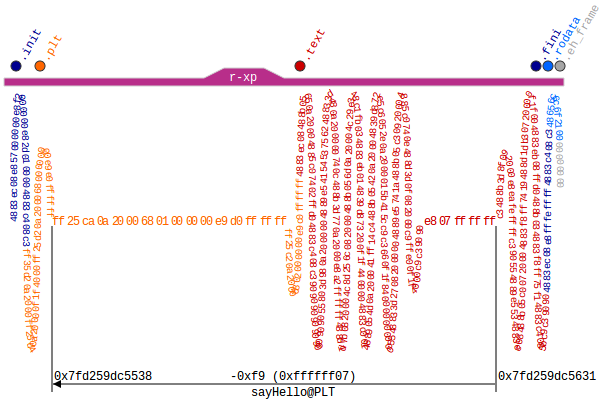 You can see from the objdump output above that the PLT entry for sayHello is at offset 0x5a0. Once laid out in memory, the offset -0x200a48 points to that PLT entry. Again, if you check, you can see the opcodes at 0x5a0 in the image correspond to the hex-output above. A Represents the addend used to compute the value of the relocatable field. B Represents the base address at which a shared object has been loaded into memory during execution. Generally, a shared object is built with a 0 base virtual address, but the execution address will be different. G Represents the offset into the global offset table at which the relocation entrys symbol will reside during execution. GOT Represents the address of the global offset table. L Represents the place (section offset or address) of the Procedure Linkage Table entry for a symbol. P Represents the place (section offset or address) of the storage unit being relocated (computed using r_offset). S Represents the value of the symbol whose index resides in the relocation entry. Z Represents the size of the symbol whose index resides in the relocation entry. The AMD64 ABI architectures uses only Elf64_Rela relocation entries with explicit addends. The r_addend member serves as the relocation addend. The special semantics for most of these relocation types are identical to those used for the Intel386 ABI 2, 3. 2: Even though the AMD64 architecture supports IP-relative addressing modes, a GOT is still required since the offset from a particular instruction to a particular data item cannot be known by the static linker. 3: Note that the AMD64 architecture assumes that offsets into GOT are 32-bit values, not 64-bit values. This choice means that a maximum of 232=8 = 229 entries can be placed in the GOT. However, that should be more than enough for most programs. In the event that it is not enough, the linker could create multiple GOTs. Because 32-bit offsets are used, loads of global data do not require loading the offset into a displacement register; the base plus immediate displacement addressing form can be used. The R_X86_64_GOTPCREL relocation has different semantics from the R_X86_64_GOT32 or equivalent i386 R_I386_GOTPC relocation. In particular, because the AMD64 architecture has an addressing mode relative to the instruction pointer, it is possible to load an address from the GOT using a single instruction. The calculation done by the R_X86_64_GOTPCREL relocation gives the difference between the location in the GOT where the symbol's address is given and the location where the relocation is applied. The R_X86_64_32 and R_X86_64_32S relocations truncate the computed value to 32-bits. The linker must verify that the generated value for the R_X86_64_32 (R_X86_64_32S) relocation zero-extends (sign-extends) to the original 64-bit value. A program or object file using R_X86_64_8, R_X86_64_16, R_X86_64_PC16 or R_X86_64_PC8 relocations is not conformant to this ABI, these relocations are only added for documentation purposes. The R_X86_64_16, and R_X86_64_8 relocations truncate the computed value to 16-bits resp. 8-bits. The relocations R_X86_64_DTPMOD64, R_X86_64_DTPOFF64, R_X86_64_TPOFF64, R_X86_64_TLSGD, R_X86_64_TLSLD, R_X86_64_DTPOFF32, R_X86_64_GOTTPOFF and R_X86_64_TPOFF32 are listed for completeness. They are part of the Thread-Local Storage ABI extensions and are documented in the document called "ELF Handling for Thread-Local Storage". The relocations R_X86_64_GOTPC32_TLSDESC, R_X86_64_TLSDESC_CALL and R_X86_64_TLSDESC are also used for Thread-Local Storage, but are not documented there as of this writing. 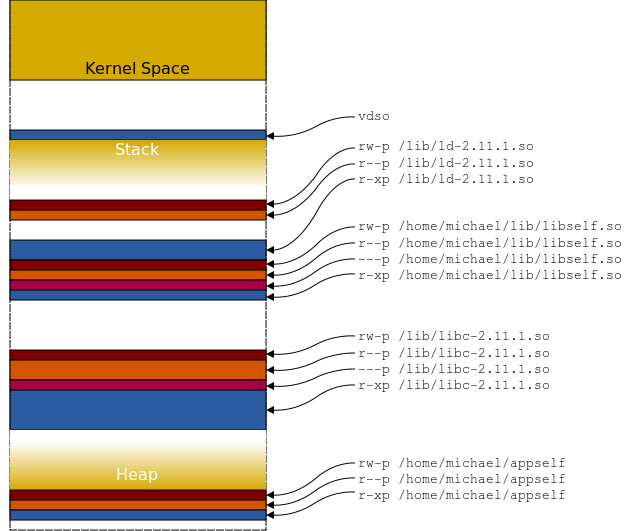 A description can be found in the document "Thread-Local Storage Descriptors for IA32 and AMD64/EM64T". In order to make this document self-contained, a description of the TLS relocations follows. R_X86_64_DTPMOD64 resolves to the index of the dynamic thread vector entry that points to the base address of the TLS block corresponding to the module that defines the referenced symbol. R_X86_64_DTPOFF64 and R_X86_64_DTPOFF32 compute the offset from the pointer in that entry to the referenced symbol. The linker generates such relocations in adjacent entries in the GOT, in response to R_X86_64_TLSGD and R_X86_64_TLSLD relocations. If the linker can compute the offset itself, because the referenced symbol binds locally, the relocations R_X86_64_64 and R_X86_64_32 may be used instead. Otherwise, such relocations are always in pairs, such that the R_X86_64_DTPOFF64 relocation applies to the word64 right past the corresponding R_X86_64_DTPMOD64 relocation. R_X86_64_TPOFF64 and R_X86_64_TPOFF32 resolve to the offset from the thread pointer to a thread-local variable. 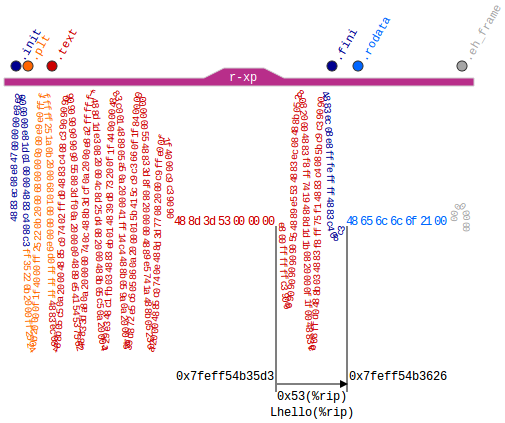 The former is generated in response to R_X86_64_GOTTPOFF, that resolves to a PC-relative address of a GOT entry containing such a 64-bit offset. R_X86_64_TLSGD and R_X86_64_TLSLD both resolve to PC-relative offsets to a DTPMOD GOT entry. The difference between them is that, for R_X86_64_TLSGD, the following GOT entry will contain the offset of the referenced symbol into its TLS block, whereas, for R_X86_64_TLSLD, the following GOT entry will contain the offset for the base address of the TLS block. The idea is that adding this offset to the result of R_X86_64_DTPMOD32 for a symbol ought to yield the same as the result of R_X86_64_DTPMOD64 for the same symbol. R_X86_64_TLSDESC resolves to a pair of word64s, called TLS Descriptor, the first of which is a pointer to a function, followed by an argument. The function is passed a pointer to the this pair of entries in %rax and, using the argument in the second entry, it must compute and return in %rax the offset from the thread pointer to the symbol referenced in the relocation, without modifying any registers other than processor flags. R_X86_64_GOTPC32_TLSDESC resolves to the PC-relative address of a TLS descriptor corresponding to the named symbol. R_X86_64_TLSDESC_CALL must annotate the instruction used to call the TLS Descriptor resolver function, so as to enable relaxation of that instruction. Notice that all regions listed are implemented by means of private memory mappings (the letter p in the permissions column). This is not surprising: these memory regions exist only to provide data to a process; while executing instructions, a process may modify the contents of these memory regions but the files on disk associated with them stay unchanged. This is precisely how private memory mappings act. One subtle thing to notice straight away is that the .bss section's offset is directly after the last byte of the loadable segment. It's also no coincidence that the .bss section is the final section in the list for the second loadable segment. The .bss section is special in that it contains uninitialised data and occupies no space in the libself.so file, but is initialised with zeroed bytes at program start-time. This is indicated by the NOBITS flag in the section header. Making the .bss section the final entry in the loadable segment is efficient since the rest of the read/write image can be written in a contiguous manner, with the .bss bytes being zeroed over whatever data happened to follow it. 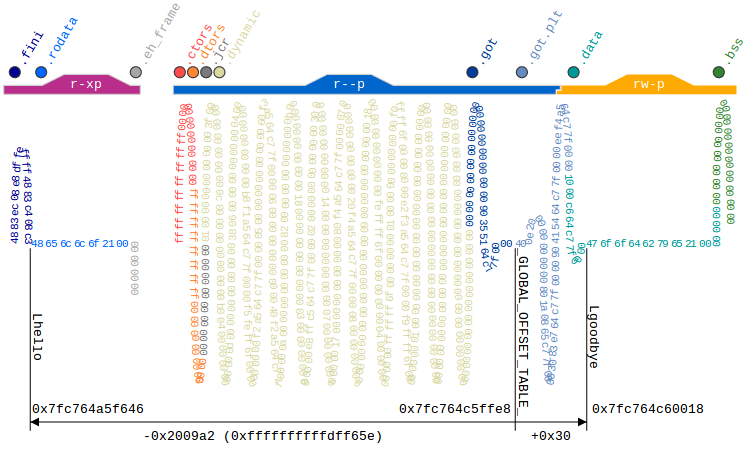 The eight bytes which constitute the entirety of the read/write .data section has been changed from its initial image and now contains its own virtual address (0x7fda05ffe060), but you can see the initialisation of the .bss section, in which 16 bytes were zeroed after the end of the initialised read/write data section (it starts at offset 0x1068 and is 0x10 bytes in length). I've highlighted the .bss bytes above, and you can see how it's simply overwritten the data outside the segment's extents. In order to make this mechanism work, you must make sure that all calls are matched with returns. Never jump out of a subroutine without a return and never use a return as an indirect jump. The above section shows the way the PLT trampoline works: the second pointer in the read/write section of libself.so's .got.plt section references offset 0x876, which is the instruction directly after the jmpq instruction. This shows that the the pointer in .got.plt hasn't yet been fixed-up to point to the target function. I'm sure that's going to sound confusing unless you already understand how the PLT works. Sorry. Copyright © Michael Guyver 2012, except as otherwise attributed. Unauthorized use and/or duplication of this material without express and written permission from this blog's author is strictly prohibited. Excerpts and links may be used, provided that full and clear credit is given to Michael Guyver and www.mindfruit.co.uk with appropriate and specific direction to the original content. Thank you _very_ much. I was having trouble with finding documentation on 64-bit x86 assembly w/ relocations, and this is the first article that has explained it well! You're welcome, Chris! There was always going to be a small audience for this kind of thing, so it's nice to know that it's been helpful. Please let me know if you find anything wrong with it.